I know I'm buku late but I finally got emoji! RT @tiffanyyyandco: My face ---------------> :D and for my iPhone users #emoji ! 02 Oct 11 copy & paste +upvote -downvote RT @tiffanyyyandco: My face ---------------&gt; :D and for my iPhone users  #emoji ! My face ---------------> :D and for my iPhone users #emoji ! 02 Oct 11 copy & paste +upvote -downvote My face ---------------&gt; :D and for my iPhone users  #emoji ! SMOOTHIEE KING HERE I COMEE!!!! Where is @Tyga going to be after the tour in ATL tonight??? 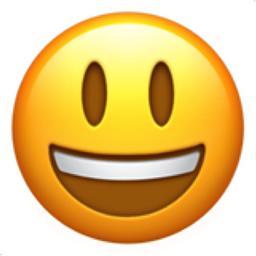 Like Smiling Face with Open Mouth Chronological Emojitweets 2?